In the case of an accident, a health crisis, or a crime, emergency telephone numbers can be found posted at all public phones. 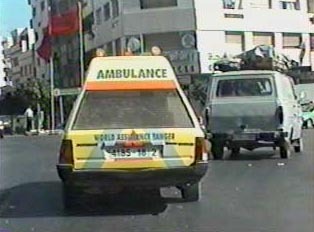 In Morocco, ambulances come promptly when called. For cleanliness, timeliness and efficiency, private hospitals often exceed public hospitals although the cost is greater. When in a public hospital, tipping can be useful in order to get better treatment. Although health clinics exist, they are scarce. When sick, one should ask a Moroccan resident for a referral to one of the many doctors in private practice. Crime in Morocco is not severe. A traveler is simply advised to use basic common sense: stay away from unsafe neighborhoods and avoid deserted streets. Theft is often a problem, and foreigners should pay attention when in public with jewelry, purses, and costly items such as cameras. Police are generally only called in severe emergencies, and not for cases such as minor theft. In the case of a crime, one may find oneself embroiled in bureaucratic delays which can be softened by a small bit of generosity.